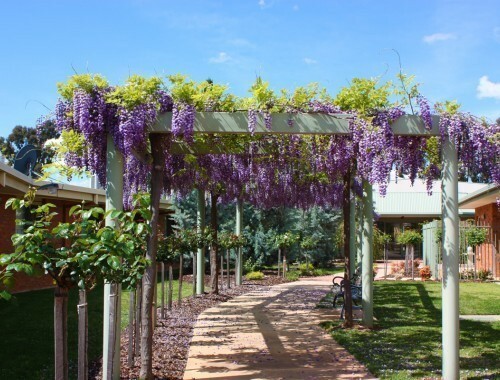 It is managed by an honorary Board of Directors and employs more than 410 full time, part time and casual staff working in three locations - Tarcoola Village - Shepparton, Rodney Park Village - Mooroopna and Kialla Gardens Village - Kialla. Our sites are currently undergoing quite a bit of development. Maculata Place recently opened on the Tarcoola Village site, and work will begin in late-2018 on the refurbishment of the Rodney Park Village residential care sites. Rodney Park Residents relocated to Hakea Lodge in Shepparton, or Macualta Place in mid-November 2018 while these works take place. Learn more about our Villages and the services they offer by browsing the links below. Tarcoola Village is situated in a garden setting close to the banks of the Goulburn River in Shepparton.